Breakfast made simple, with an explosion of flavor! 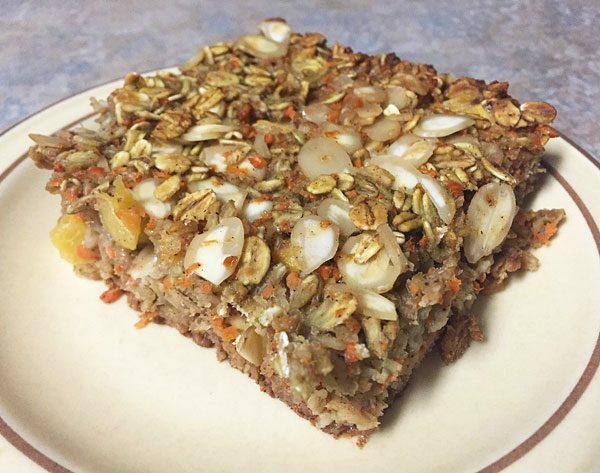 Baked oatmeal is one of my go-to meal preps for breakfast! It’s noncomplex, keeps well and is open to a variety of add-ins so you can switch up the flavors. Plus, if I use a good brand of old fashioned rolled oats then I can make sure I’m sticking to my gluten free food goals. One of my favorite smoothies to make is a peach carrot one. I just love the combination of flavor between these two! Plus, it’s a great way to get in a serving of both fruits and vegetables. On Sundays I usually meal prep for the week ahead and became inspired by this particular smoothie. I know carrot and cinnamon work extremely well together with oats, but I wanted to add in a fruit too. 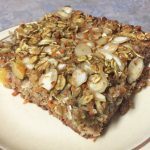 Since it’s peach season I am throwing them in multiple recipes, and this seemed like a perfect new flavor of baked oatmeal to try! First peel and slice a fresh peach. Dice and put in a bowl to set aside. Next put some carrots into a food processor and pulse until finely chopped. 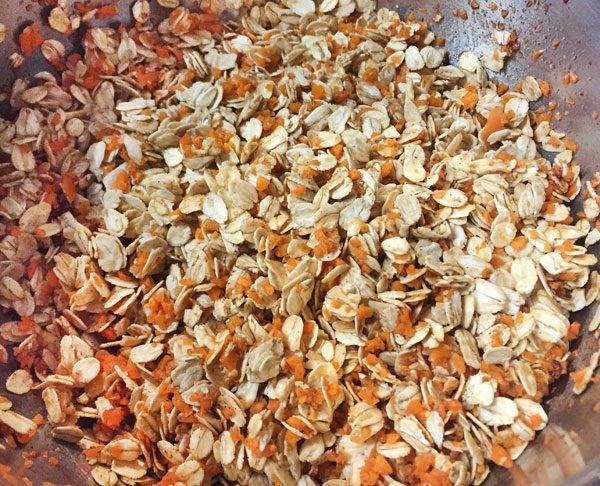 Combine the oats, baking powder and cinnamon with the shredded carrot in a large bowl. Next pour in the milk and drizzle in the agave and vanilla. Add the eggs and stir everything together, adding the peaches and almonds last. I chose to use shaved almonds but you can always get whole ones and toss them in the processor too. Grease a pan and then bake at 375 for 25 minutes. Once done enjoy right away or store in the fridge and reheat throughout the week. I wasn’t sure how this would turn out but I am SO glad that I experimented! Definitely a breakfast win! Slice up a peach and place in a bowl to set aside. Put some carrots in a food processor until finely chopped. In a large bowl combine the dry ingredients and carrots. Next add in the wet ingredients and stir. 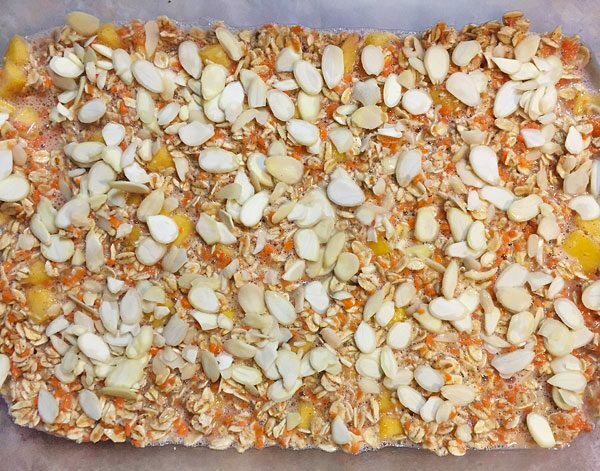 Once all mixed together you can include the peaches and almonds. Spray or grease the pan before pouring the mixture in. Bake at 375 for 25 minutes. Remove from oven and serve, or store in the fridge for eating later! I chose to use almond milk but you can use your milk of choice! 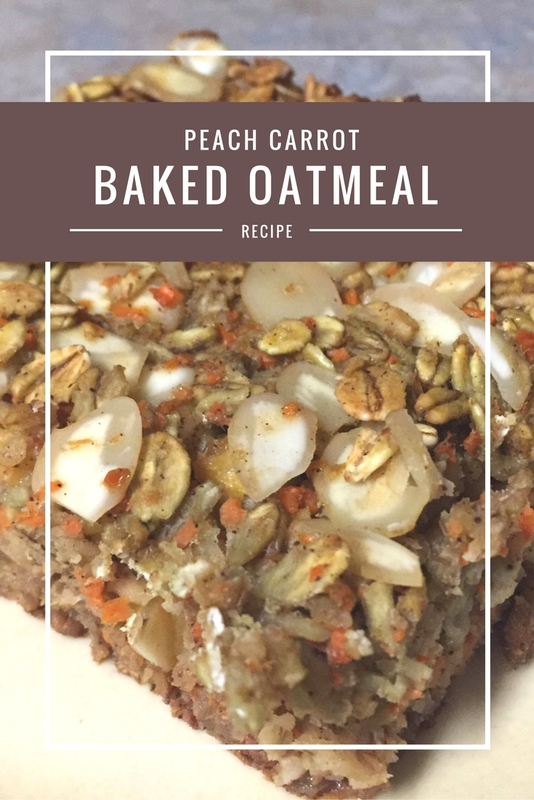 If you liked this peach carrot version then check out this post for another baked oatmeal recipe! I am also a huge fan of overnight oats. Both of these methods are healthy, quick breakfast options to keep you on track when you are on the go! Plus, I love gluten free options and meal prep breakfasts! The food processor I use is Ninja brand. I seriously use this ALL.THE.TIME. It’s a breeze for helping to make things quicker in the kitchen. When making this as a meal prep it can count for six servings. Each serving consists of 3/4 yellow container, 1/6 purple, 1/6 green, 1/3 blue, and 1/3 red.